The delivery firm UPS has unveiled a drone-launching truck - but the event did not go completely to plan. "Drivers are the face of our company and that won't change," said Mark Wallace, the firm's senior vice-president of global engineering. "What's exciting is the potential for drones to aid drivers at various points along their routes. Imagine a triangular delivery route where the stops are kilometres apart. 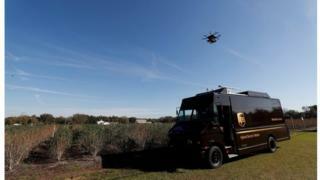 "Sending a drone from a package car to make just one of those deliveries can reduce costly kilometres driven." The initial test went well, with the aircraft launching from a platform built into the truck's slide-open roof. The drone tipped over when it tried to take off, rocked back and was then nearly crushed when the truck's roof began to close over the launch pad where the machine was still sitting. "For the photographers we tried to do a quick non-traditional delivery and something went wrong," Stephen Burns, chief executive of Workhorse, told the news site Techcrunch. "We probably shouldn't have tried to do something weird like that with everyone watching." "We have no idea how all that will play out until we find out how to integrate them into the business," Mr Dodero told reporters. Drones are, however, already making medical deliveries in Rwanda - a project UPS is involved in - and Amazon is testing the tech in the UK.